Just 10 days ago we had 5 inches of new white fluff on the ground. Today the thermostat is going to hit fifty four which means the snow is long gone. 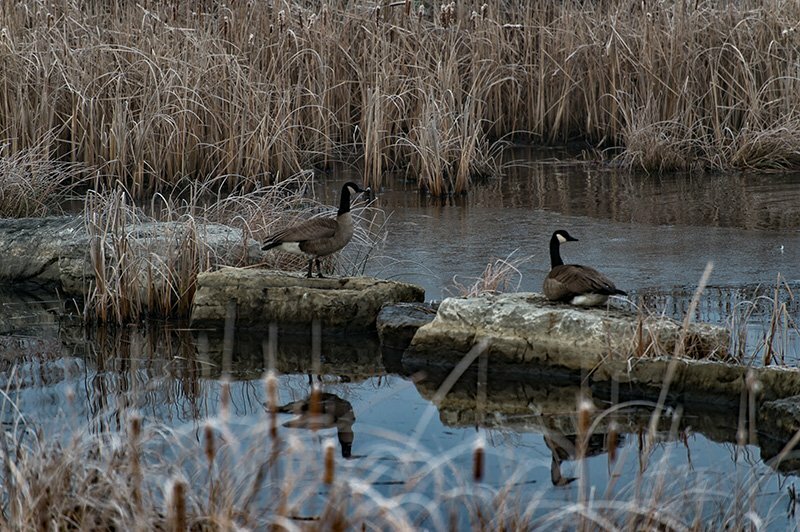 For our Canadian Geese population, although a hearty winter bird, they often fly to slightly milder climates where food and water are more easily accessible. With our crazy weather patterns, there innate biology to fly south might be wondering should I stay or should I go. We are currently in an el-nino pattern with our weather so it has been unseasonable warm and they really have no incentive to fly anywhere because they are finding what they need. When I ventured out this morning, there was fog and the frost was still on the cat-tails and ground crunching underfoot to the point where you could easily see your foot steps. This monogamous pair took refuse on the rock bridge in the pond and was intently watching the others in the flock. One of the largest of the goose species,it is literally found on the entire North American continent. Excellent parents with their offspring, they will protect and guard them with tenacity when threatened. Having watched them for awhile, they ventured off the rock and onto the half frozen half thawed pond to do a bit of cleaning on the plumage. I was very taken by the reflections so I grabbed a quick click. I love communing with nature in the early hours. Rejuvenates the soul!